Mwave's tweet - "[#LIVE #2018MAMA] Congratulations! 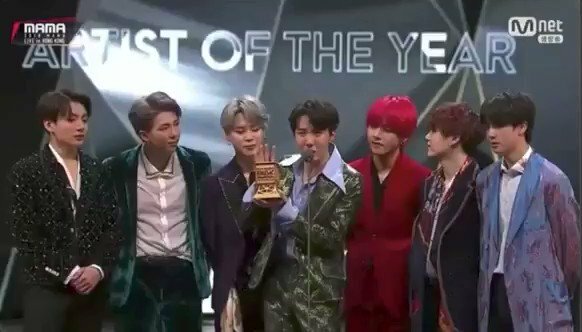 2018 Mnet Asian Music Awards | Grand Prize 🏆 Artist of the Year #BTS @BTS_twt ▶️ Watch Live at "
Our @BTS_twt congratulations with your well deserved Artist of the Year DAESANG! ARMY loves, because you showed us to love ourselves 1st. WE COULD NEVER ASK FOR A BETTER GROUP MEN TO STAN. WE PURPLE YOU @BTS_twt ! You deserve the whole world plus more. 3year's in a row boys... You made it again @BTS_twt . Really proud of you!!!!! Congratulations 😭🙏👏👏👏 #BTSxMAMA_HK2018 #BTS #ARMY with 2 daesang tonight!!!! #BTS #2018MAMA 😭😭😭😭 não aguento ver eles chorando, choro junto, amo muito. I only understand half and I’m crying so hard! Congratulations my baby's , I'm so proud of them! We my motivations group! @BTS_twt Jin, Suga, J-hope, RM, Jimin, V and Jeongook ! Don't cry please! Desde que mi sol se le cortó la voz, dije oooooh Dios mío No por favor tu llorando NO! I'm crying. You're Crying. Yes, we're crying. @BTS_twt you deserve it! Congratulations! 사랑해! NANANANANANANANA SON MI VIDA. QUEDE SIN PALABRAS. No cuenten conmigo hasta nuevo aviso. I cant stop watching even if it breaks my heart to see them crying.